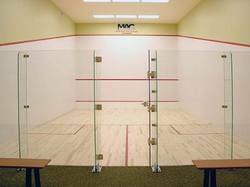 Manufacturer of Squash Court Glass Back Wall. Our product range also comprises of Indoor Sports Floor, Outdoor Sports Floor and Portable Sports Floors. • This glass back wall is stabilized with 30cm deep glass fins. The squash court door is opening (DIN left) to the inside and is fixed to hinges at the side. • The fins are fixed to the floor with angles and then the floor I installed. The opening in the floor with around 25cm x 35cm is covered with an anodized aluminum plate. • The A ONE Freestanding Glass Back Wall consists of two glass panels of 2.13m x 2.75m and a door, which is 90cm wide and made of 12mm safety glass. • This glass back wall is mostly used in connection with the installation of a glass court. • Glass headpieces can be installed at any time. For this purpose it is necessary to plan the supporting profiles at the side walls high enough and to fix a steel tube at the right height. The headpieces are then hung from the carrier.Thus all connection details are solved.